• Sensitive and accurate. Use 10 mL samples. 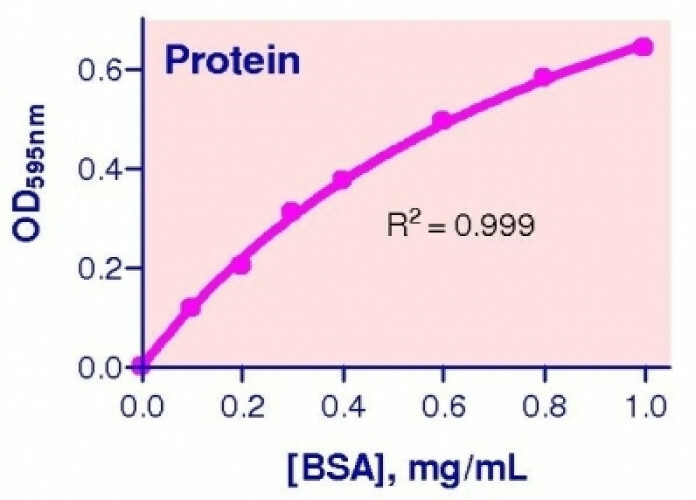 Detection range 0.06 - 1.0 mg /mL protein in 96-well plate assay. • Low interference. 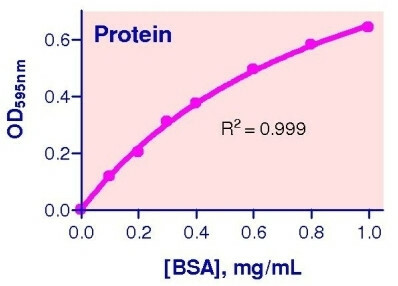 Glucose, Tris, vitamins, and amino acids, DNA, RNA, salts, EDTA (<12 mM), phenol (<50 mM), urea (<0.6 M), Triton (<0.1%) and SDS (<0.1% SDS) do not interfere in the assay. • Versatility: assays can be executed in 96-well plate or cuvet. The protein is known as the "building blocks of life" and is one of the most important macromolecules in life science. Proteins are polypeptides made up of amino acids and play various key roles in all aspects of biology. Protein quantitation is a very common practice for life scientists. Simple, direct and automation-ready procedures for measuring protein concentration are very desirable. BioAssay Systems’ QuantiChrom™ protein assay kit is based on an improved Coomassie Blue G method. The dye forms a blue complex specifically with protein, and the intensity of color, measured at 595nm, is directly proportional to the protein concentration in the sample. The optimized formulation substantially reduces interference by substances in the raw samples and exhibits increased sensitivity towards peptides.